A handy Chrome extension lets you continue watching a video while checking out the rest of YouTube within the same tab. One of my favorite features of YouTube’s mobile apps is its multitasking mode. This genius feature allows you to continue watching a video in a smaller panel while searching for other items within the app. I’ve often wished I could do that on my PC since the only alternative is to open a new tab and use Windows’ Snap feature to see the video and the rest of YouTube at the same time. 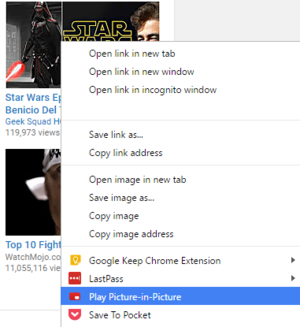 That is, unless you use a handy Chrome extension called YouTube Picture in Picture (beta), which brings YouTube multitasking to your PC. First, of course, you have to download and install Picture in Picture from the Chrome Web store. Once that’s done, you’re ready to roll. There are no settings to tweak or functions requiring you to click on the extension icon. Picture in Picture (beta) adds an option to the right-click context menu. Just go to YouTube to start using the picture-in-picture feature. To test it out starting watching a video. Once the video is running, click on the YouTube icon in the upper-left corner to go back to the homepage. As you do so, the video you were watching should automatically collapse into a smaller, borderless window in the lower-right corner of the YouTube page. If you hover over the playing video you’ll see you have full access to the regular YouTube controls. Just above the video you’ll also see three buttons for expanding the video to a slightly larger frame, closing the video entirely, or returning to the video’s page. The only other feature in the extension is a single addition to the right-click context menu. When you are looking at a list of videos to play, right-click on the one you want to watch and you’ll see the option to automatically play it in picture-in-picture mode.